Select the service you need and pay accordingly, starting with ½ day consultation on site or at your home. We prepare initial query list by post outlining the most essential items to be considered for your new extension. Later at the meeting queries will be raised from the posted list, and discussed in detail. We will survey the dwelling and prepare initial sketch proposals and advise you of further services should you require same (you decide what you require). We will write to you outlining a flexible list of services for you to select from, showing costs for each element e.g. developed sketch plan, planning application, construction drawings - tender documents, supervision etc. from which you can select only what you need. The cost of the home visit and preliminary sketch design is €400.00 plus VAT @ 21%, this includes visit to your home advice given and the sketch proposals which will address your specific requirements. Addressing the main issues for your project at the outset avoids typical mistakes and the design suggestions are geared to save you money on the running costs of your home and the build cost. 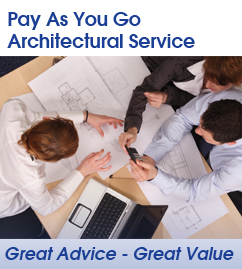 We offer the same service, but the cost has to be higher if a preliminary design drawing is required, the ½ day consultation is still €400.00 plus VAT. If a preliminary design sketch is required the additional cost is €800.00 plus VAT @ 21%. This, however will give you a preliminary design that optimises space, light, solar gain and will address the issues pertinent to your site, and your brief.